Because you depend on reliable sweeper brooms to keep your runways clear and safe, A complete line of Runway Sweeper Wafer Sections built to sweep the way you expect -- tough enough to cut through the worst ice and snow, with durability to give you more sweeping hours when it counts most. Sweepers compatible with the most popular sweepers on the runways today. They also meet U.S. and Canadian government specifications for use on military bases. High-Speed Cassette Sections offer quick replacement, saving you time and money. One person can change all the cassette brush sections without removing the core from the sweeper, regardless of where the sweeper is located. High-Speed Cassette Sections can be used on all types of runway sweeping equipment. We carry a complete line of quality sweeping products -- for many types of sweeping equipment, and for many sweeping applications. • Our reputation for quality sweeping products is on your side when your sweep with our Poly Filled Gutter Brooms. 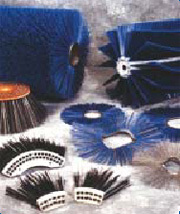 • Compatible with the most popular mechanical broom and vacuum sweepers. • Made with our own virgin-poly filament for superior “flick action”. • Poly/Wire Combo Tube Brooms also available. • The Original All Poly, Quick Change Strip Broom. • Easy to change and replace, and 100% recyclable. • Compatible with the most popular broom sweepers and tractor-mount sweeping attachments. • All Poly, Poly-Wire mixed, and Combo sets available. • Available in flat or convoluted sections. For all broom applications, using the correct filament is the key to maximum broom life. Poly and wire filaments used in combination to sweep a variety of conditions without changing cores. Effective for sweeping in a general mixture of mild conditions. Made of .080 x .095 diameter virgin polypropylene. Typically this is the longest lasting filament and is used for sweeping in all seasons. Poly filament provides maximum “flick action” due to better flexibility under routine sweeping conditions found when sweeping light debris, dirt, sand, leaves, paper, etc. Made of .028 diameter, high carbon galvanized spring steel. Wire is the strongest and most aggressive type of filament due to very sharp tips that provide cutting action. Best used in wet or compacted snow and ice removal.